How To Operate On A Patient Who Might Explode : Shots - Health News In rare but tricky cases, disposing of an explosive device requires removing it safely from a living person. Military doctors have ways to minimize the risks, but there's no way to eliminate them. A woman with a cut on her cheek and trouble seeing with her left eye was admitted to Craig Joint Theater Hospital at Bagram Air Field, Afghanistan. X-rays showed a projectile that surgeons decided to remove. In the summer of 2014, a 23-year-old pregnant woman entered the military hospital at Bagram Air Field in Afghanistan with a cut on her left cheek. The wound had been stitched up elsewhere, but she still wasn't quite right. She said she'd been hit in the face by a ricochet back in her home village. What hit her exactly, she couldn't say for sure. She was upset, though, because the vision was bad in her left eye, even though there had been no apparent trauma to it. "That was the only tip-off we had that something else was going on," says Dr. Travis Newberry, a head and neck surgeon and U.S. Air Force major who is now based at the San Antonio Military Medical Center in Texas. Right away, he ordered a CT scan. "I wasn't expecting to see much at all," he says. 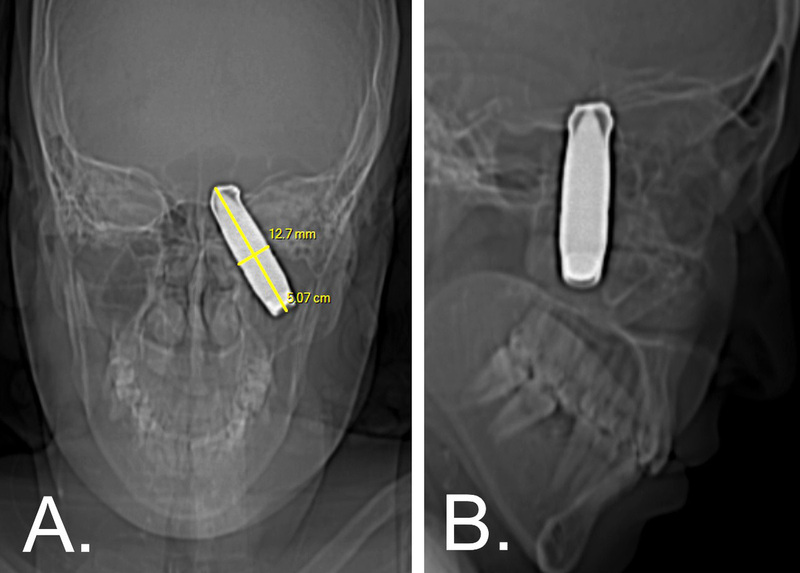 But as the image slowly loaded, line by line, he realized that something big – a half-inch wide, and 2 inches long — was lodged vertically inside her head. "It was extending from just above her teeth through the base of the skull, touching the brain," says Newberry. It would have to be surgically removed, but he and his colleagues couldn't tell what the object was. "It was awfully large and it wasn't a fragmented bullet, which is what we usually see," he says. "You could see the projectile, which was shaped like a bullet, but you could also see kind of a rim around it," says Newberry. Was it just a large bullet, or was it a large bullet packed with explosives that could still detonate? The second option was worrisome. An operation could cause the object to explode in the patient's head, killing her and endangering the second-trimester fetus she was carrying. An explosion could also injure the surgical team, especially if the blast ignited flammable materials in the operating room. An explosives expert gave the team samples of bullets that were common in Afghanistan. The surgical team compared radiological images of them with ones they had of the object in the woman's skull. They concluded that it looked like a nonexplosive, but they couldn't be sure. They prepared for the worst. The surgical team wore protective helmets and goggles and put flak vests over their scrubs. They skipped the usual oxygen-enriched air supply for the patient during surgery, to minimize the risk from fire. Likewise, they avoided an electrocautery device that controls bleeding by burning the edges of blood vessels, because of the possibility the device could set off an explosion. After all the preparation, the nerve-wracking moment came when Newberry had to pull the object out. "I put graspers on it and squeezed it hard," he says. "That was the point where everything was exposed and I was exposed, so I guess during the whole case that was the scariest portion." He extracted the object, handing it over to the explosives expert. It turned out to be a metal bullet. The team removed their protective gear, brought everyone back in, re-scrubbed and starting reconstructing the woman's face. She left the hospital five days later. During a follow-up visit a few months later, her pregnancy was still progressing normally, but she hadn't recovered vision in her left eye from nerve damage caused by the injury. Newberry and his colleagues published an account of the case Feb. 2 in the Journal of Neurosurgery. Even for surgical teams in the military, it's rare to encounter patients who might also be weapons, says Dr. Michael Wirt, a colonel and commander of the U.S. Army Institute of Surgical Research in San Antonio. Since World War II, there have been only about 40 reported such cases in U.S. military data, all successfully extracted, he says. But the risks to medical teams are high enough that the Army has a how-to guide on removing "unexploded ordnance" inside the human body. "We'll have maybe a single general surgeon or a single orthopedic surgeon at the site," says Wirt. "The result of not recognizing it places the entire surgical team and the hospital in danger." Revised Army guidelines for removing unexploded ordnance from patients are set to come out in February. Dr. John Oh, a colonel with the U.S. Army Medical Corps, was involved in a case that put his training to the test. He remembers a simulation before he deployed to Afghanistan, in which Nerf balls stood in for rocket-propelled grenades. A mock patient had one in his abdomen, so Oh decided to help him. "This guy is impaled with a rocket so let's take him in for [surgery]," he remembers saying at the time. The lights shut off and the drill ended. Oh was told that he had failed the test. In a mass casualty situation, Oh learned, he was supposed to let the man die. "Because if the thing exploded, you destroy your entire surgical facility and the only surgeon," he says. Oh brushed the moment off. "When we did the training I was like, 'Well, this is never going to happen, so I don't need to worry about this,' " he says. A few months later, he was in Afghanistan working out of a shed turned operating room at 7,000 feet altitude. Outside, he says, it was just dirt and sand. A patient came in with a serious wound in his abdomen. He was bleeding a lot, even through many layers of gauze, and was in hemorrhagic shock. When Oh started removing the dressings, he realized he was looking at the tail fins of a rocket-propelled grenade. "It went clear across his pelvis," Oh says. Oh was the only general surgeon there. He and his colleagues were still figuring out what to do when the sedative they'd used to help put in a breathing tube made the patient's heart stop. "At that point, we literally had to make a life or death situation. Either we let him die right now or we go to the operating room and see what we can do," says Oh. Oh made the same decision that had failed him in the training drill — operate. "The first cut I made was over the tip of the rocket," he says. 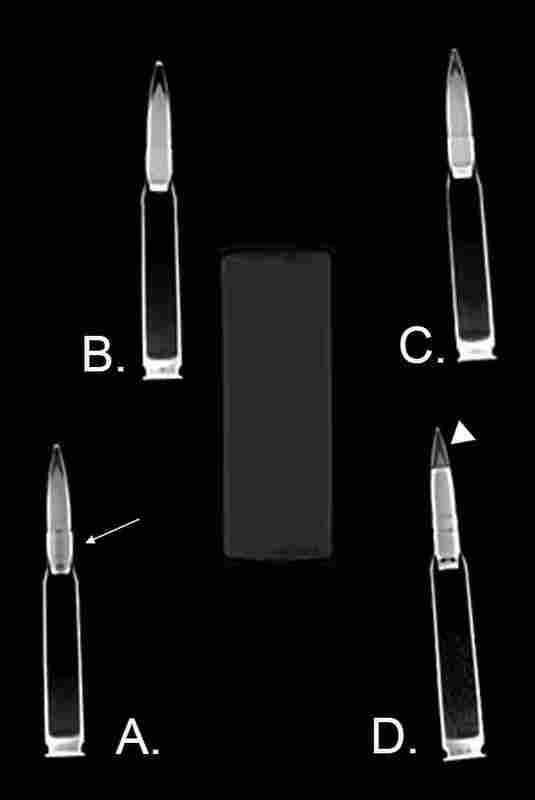 An X-ray showed that the warhead, the most dangerous part of the rocket, had broken off. "But the fuel and the detonator might still be in the rocket," says Oh, "The big unknown was still whether or not there was a part of it that would explode while we were still doing the surgery itself." The surgical team managed to carefully remove the device and handed it over to an explosives expert, who detonated it outside. The case involving Pvt. Channing Moss drew worldwide attention. He recovered eventually and learned to walk again. "Up to this point in the war in Afghanistan, there had been no accounts of victims who had survived being impaled with an RPG," Oh wrote in a chapter on how to remove unexploded devices from patients in a textbook on disaster surgery. "I didn't make a logical choice," says Oh. "The whole time I'm doing this risk-benefit analysis in my head, but the one outcome I knew would happen is that if we didn't do anything he would die." The medical teams who operated on the 40 or so patients containing potentially unexploded devices made decisions that could be considered rare and reckless, says John Harris, a professor of science ethics at the University of Manchester. But, if you zoom way out, he says, "Our health care systems are just a dimension of the Rule of Rescue," the drive to save others from avoidable death. "Think of people who expose themselves to Ebola or to other infectious and very deadly diseases when nursing patients," says Harris, who wrote a book on medical ethics. Newberry and Oh faced acute versions of the same decision. As for the training intended to teach people to leave unusually dangerous patients behind, Harris says, it's difficult for people to comply. "Most doctors are not trained in that way," he says. "And most health care professionals are not trained in that way. And, indeed, most human beings are not trained, by our peer groups, our parents, our schooling and so on in that way — to abandon people in danger."